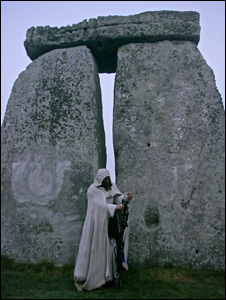 The new British Archaeology, which went live online today (February 8), reports significant new discoveries near Stonehenge, among them the grave of a man who might have seen the earliest megaliths erected at the site. Cremated remains of over 100 people were buried at the first Stonehenge, from 3100BC – the largest cremation cemetery in prehistoric Britain. Human remains of this age are otherwise rare in the world heritage site, or across Britain as a whole. So it is noteworthy that the man buried at West Amesbury, who was not cremated, probably saw funerals at Stonehenge quite different to his own. Five pits in the chalk contemporary with the henge’s origins contained huge amounts of artefacts. These include quantities of Peterborough pottery, in large fresh sherds, all in the Fengate style (one of these pits has more pottery in it than the whole of prehistoric Stonehenge).